Cocktail bar on the High Street. It opened in April 2017. It originally billed itself as a cafe-bar serving food all day, including breakfast, but later pivoted to only opening in the afternoons and evenings. According to its venue manager (via email) as of January 2019 the only food available is "sides and platters". 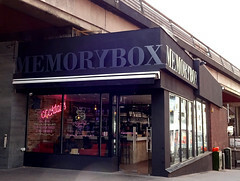 It was previously a cafe called Caffe del Ponte photo, but this closed for refurbishment in early 2017 photo of sign, and when it reopened it had been transformed into a cafe-bar called Memory Box. When it was Caffe del Ponte, the procedure was to order and pay at the counter. There was seating for around 25 people on banquettes and upright chairs, and a further 18 seats on high stools. It had the same owners as neighbouring Cantina and Ponte Nuovo. Before Ponte Nuovo and Caffe Del Ponte opened up, the owners had another restaurant (Il Ponte) across the road in the space now occupied by Buffalo American Bar And Grill. Existence last checked in June 2018. Last edited 2019-01-31 14:39:18 (version 29; diff). List all versions. Page last edited 2019-01-31 14:39:18 (version 29).